The illusions of many Americans that Obama would turn out to be an “antiwar president” were definitively shattered early last year when he sent 30,000 more troops to Afghanistan. Since that time, the Obama administration’s attempts to convince the public that the war would soon wind down have proven hollow. Instead, Washington is expanding its war effort onto a much wider front—as the daily bombing missions over Libya show clearly. On June 27, Obama argued that he was winding down the war in Afghanistan by withdrawing up to 30,000 ground troops over the course of the next year and a half. But all the while the U.S. has been planning to drive forward with a so-called “counter-terrorism” strategy that will put more civilians in the path of drone-fired missiles and covert special operations forces. On June 8, Mark Mazzetti reported in The New York Times that the United States, after a halt of a year due to fallout from civilian casualties, had restarted and intensified a campaign of drone aircraft strikes in Yemen. And on July 1, Mazzetti wrote that the U.S. was expanding the drone war commanded from a base in Yemen to Somalia. For the last several years, the U.S. efforts to prevent the establishment of a Somali government independent of the White House was primarily a proxy war, funded and directed by the U.S. but carried out by Ethiopia and Uganda. Now, the U.S. government is openly and directly engaged once again. Counting Somalia, the U.S. is now waging at least seven wars in a nearly contiguous region involving parts of South and Central Asia, the Middle East and Northern Africa, and the Horn of Africa. And while the expansion of the drone wars is supposed to be a trade-off for the use of ground troops, news reporters revealed on July 3 that the U.S. had asked China for aid in the establishment of new and alternative supply routes to Afghanistan. In response to this buildup in U.S. military attacks on the sovereignty and self-determination of the peoples of this broad area of the globe, U.S. antiwar organizations have begun to create an audacious calendar of education and protest. Attendees approved a motivation for the emergency actions that characterized the attacks on Libya as part of the effort of Western governments to contain and roll back the Arab Spring, perceiving it as being of a package with the over $20 billion dollar infusion of “aid” being rushed to Tunisia and Egypt to retard the development of the mass movements. The UNAC CC meeting also called for activists to attend the Thursday, Oct. 6, “Stop the Machine” kickoff of nonviolent civil resistance scheduled for Washington, D.C., and urged all UNAC affiliates and grassroots antiwar committees to mark the 10th anniversary of the war on Afghanistan with nationally coordinated local demonstrations and rallies on Sat., Oct. 15. On that day, activists will demand: Withdraw all U.S./NATO military forces, contractors, and bases from Afghanistan, Iraq, and Libya now! End drone attacks on defenseless populations in Pakistan and Yemen! End U.S. aid to Israel! Hands off Iran! Bring our war dollars home now! Money for jobs and education, not for war and incarceration! The Oct. 15 actions, it was noted, can be the occasion for antiwar groups to reach out to the unionists who are protesting cutbacks and job loss, to the Muslim American communities suffering increased harassment, to the Palestinian youth organizations energized by the recent efforts to break the blockade of Gaza, and to all community groups that would benefit if the war dollars were brought home and spent on social needs. Every activist won through this outreach will then be invited to attend a large, open, and democratic conference to Bring the Troops and War Dollars Home Now that is scheduled for Nov. 11, 12, and 13. In 2010, the United National Antiwar Conference in Albany, N.Y., attracted around 800 activists, hosted over 40 workshops with 70 authoritative speakers, and was capped by a one-person/one-vote plenary that called fall and spring actions. The UNAC CC is planning a conference based on the Albany model at which activists from around the country can have direct input into the next year of antiwar campaigning. This year’s conference will have a special responsibility to craft and build a political mobilization in opposition to the combined NATO/G8 summit recently announced by Obama and scheduled for Chicago on May 15-22. Based on a resolution voted up at the June 18 Coordinating Committee meeting, the United National Antiwar Committee acted immediately when the Chicago location and dates for the summit were set and applied for permits for an opening-day action on Tuesday, May 15, and a massive peaceful, legal march for “Money for Jobs and Education, Not War” on Saturday, May 19. The representatives of the 46 groups present at the June 18 UNAC CC resolved that UNAC, in conjunction with a broad range of groups and organizations that share general agreement with the major demands adopted at our 2010 Albany, N.Y. national conference, would initiate a mass demonstration at the site of the NATO gathering. The group also resolved that UNAC would welcome and encourage the participation of all groups interested in mobilizing against war and for social justice in planning a broad range of other NATO meeting protests including teach-ins, alternative conferences, and activities organized on the basis of direct action/civil resistance. In addition, UNAC began immediately to pave the way for international collaboration on this protest on the occasion of the gathering of the most powerful coalition of war makers on the planet. See www.UNACpeace.org. > The article above was written by Christine Marie. 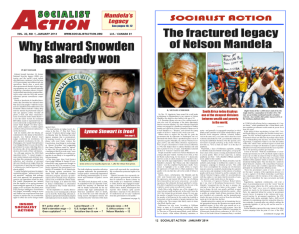 It first appeared in the July 2011 print edition of Socialist Action newspaper.